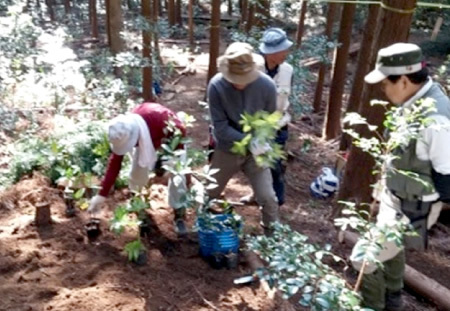 At U-CAN we want to be able to hand over our forest resources to the next generation in a healthy state, so we engage in tree-planting activities to regenerate the forests. We understand the role of forests, and protect and nurture the natural environment passed down from our predecessors because these are treasures for all of humankind that we have inherited over the generations. 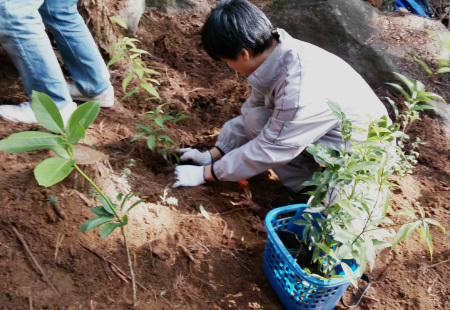 On a hot day of bright sunshine, the third tree planting activity was held at Mt. Tsukuba. Having become comfortable with the work and taking advantage of the softer soil from the rain a few days before, we worked with brisk efficiency. It was most encouraging to see the young trees which we had planted on our first activity were thriving. 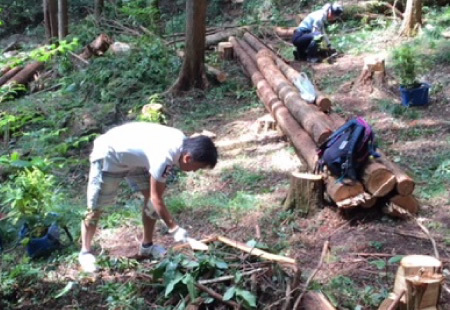 Continuing on from our beginning efforts of last year, we held our second tree planting activity at Mt. Tsukuba. The number of participants more than doubled that of last year, and we worked on a broader planting area this time. 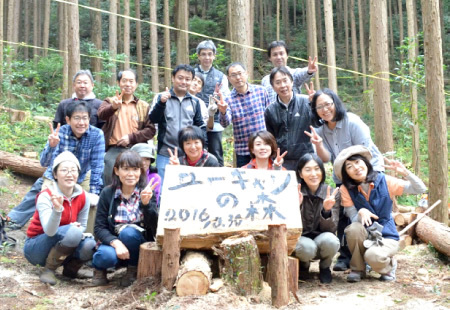 Individuals who also participated in last year’s activity remembered the routine and took to their work with an experienced approach. We fervently hope these seedlings will grow into a fine forest and we are committed to planting more trees in the future. This month we engaged in our first tree planting activity at Mt. Tsukuba. Our U-CAN employees and their family members as well as our instructors took part. Although it was our first attempt at an unfamiliar task, we thinned the sloping land to allow enough sunlight and space, and gently planted the seedlings. 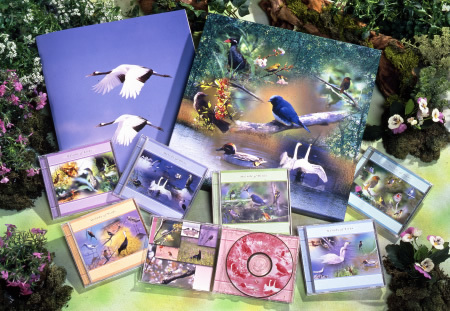 At U-CAN, we singled out 100 species from among the approximately 590 species of wild birds in Japan and are selling their chirping and singing as a set of CDs entitled the “100 Best Bird Songs.” This project gives us an opportunity, as a special corporate member of the foundation, to make a yearly donation to the Wild Bird Society of Japan and support its activities aiming at conserving nature for wild birds.